Fail "Caesar" Part 7: Inventing More Coded Prisoners? Note: I hear my previous attempt to explain this wasn't clear enough ... it is a complex subject. There may be no alternative but to ask the reader to go carefully with me step-by-step, and it seems wise to risk over-explaining it than the opposite. This could go under part 5 (questioning the number system) or 6 (evidence the victims were NOT government prisoners), but it deserves to be its own part 7. One of the confusing things one can see in the "Caesar" photos is an occasional out-of-place hospital image, white or blue-tinted, on linen sheets, tables, or tile, having the same victim number range as those dirt-backed bodies it sits by, but a different time months earlier. See branch 227 page 19 at the database of the photo's custodians, the SAFMCD (Syrian Association For Missing and Conscience Detainees). 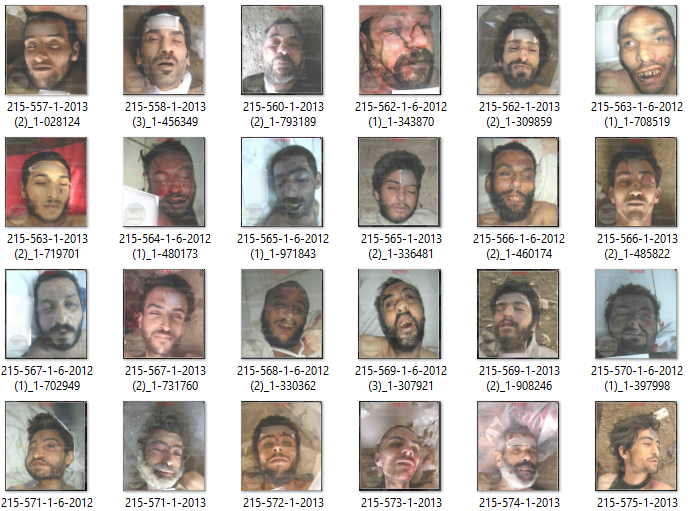 Two photos clearly stand out like this, and a couple others could, but only the three marked in red truly fit and play into a pattern that may help expose one of the worst running crimes of the entire Syrian conflict. Here's a different batch blamed on a different division (branch 215 "secret raids and intrusions"). This plate is from my growing file of screen grabs processed with the SAFMCD's info, and organized by alleged prisoner number in sequential order - here #557-575. Missing entries haven't been found/processed yet. Numbers explained (useful throughout) as in the first picture (check entry here): 215 = the blamed military intelligence branch. 557 = the alleged prisoner number there (or some think it's an order of death at the branch, but we'll use prisoner #). 1-2013 is the date on the folder the picture was first put in. The (2) seems to mean second photo in a sequence. The _1 comes up sometimes, meaning unclear. And the last 6-digit number beneath this and all is the random SAFMCD code#, which can be used to search the photos and check the information (individual entry pages like the one linked above have a "Search in Numbers Martyrs" box). Note: Anyone sensing a wall of tedium or impending headache here can first skip the details totally, bolded questions Q1-Q5 (and skim supporting details as needed), and then read the concluding parts on what it means and why, and consider Q6. Resuming analysis ... In the plate above, we can see 10 of these in a row, prisoner #s 562-571, fit the profile of clean and white and dated June, 2012, compared to the running time frame of January, 2013 (seen on the other entries, as well as those before and after). This stretch is nearly complete, and as we can see, most of these hospital photos (562, 3, 5, 6, 7, 9, and 571) have duplicated numbers - so they probably all do. The setting difference is no clear issue - early on, the photos were taken inside military hospital 601, and then as the scale grew too huge the work was all taken outside. But the repeating "detainee numbers" at the two times is very unusual. Similar patches appear all through the earlier portion of the 215 folder - duplicates where one fits with the overall flow, and one is a photo of this type and date. I've located a total of 48 there so far, and that's probably about it. Out of 3,556 photos in the mammoth 215 folder, I've seen perhaps no duplicate numbers that didn't wind up being part of this set of 48. Any others there might be could be just typos or errors, but this majority is a continuous pattern and no fluke. Q1: Why were these dozens of prisoner numbers issued twice, when once was to this odd set of those killed in mid-2012, and hardly any others who appear have such duplicate numbers? I've also noticed very few victims in the big folders 215 and 227 even seem out of sequence. Generally the prisoner number ticks up along with the timeline at a steady rate. In the plate above, all photos I've found in the 557-575 range for 215 - that aren't hospital duplicates - all appear in the same date folder 1-2013. None appear earlier or later. Those before and after do the same or, at the low end they might be in the previous folder or at the high end they'll start appearing in 2-2013. Adjacent entries usually do not seem taken at the same time, suggesting small-scale mixing. But the larger patterns suggest sequential numbering is the norm. And aside from these light-blues patches, that correlation continues over the whole span of photos. Q2: why would nearly all those with their numbers repeated also have to be out-of-sequence high-number early fatalities? Besides the 48 photos from 215, there are similar threads of victims seen in nearly all other folders - 216, 227, 235, 251, j, "sporadic views," and especially "unknown branch." At least 133 identified entries from eight folders fit this pattern. A few show people who were starved (example), more show signs of chemical exposure (purple color, skin irritation, damaged eyes, blood and mucous from the mouth and nose - example, example), fewer have visible (neck-up) signs of violence by guns or blades (example) and most are unclear. Like the rest of the "Caesar" photos they tend to show unidentified victims of horrible abuses, but these stand out as all white, interior, out of place where they are and often clashing with the other numbers. Q3: Why would 6 branches plus unclear others collaborate in this strange selective duplication? Summary of the apparent laundering method: these photos were split up and shuffled arbitrarily into different folders. The date is left alone, and the hospital number is - unusually - displayed in the text, but put next to j, 215, etc.. Thus they become out-of-place prisoners of different branches, with duplicate entries in almost every case when put into the fuller folders 215 and 227. I start where I can see a reliable pattern of numbers that's no fluke, and just from there, at least 133 similar photos from 8 folders seemed to fill in a solid pattern, as laid out (a bit roughly) in a large table here at ACLOS. This will be updated unless it's actually complete now. It seems to be close to it. They seem misplaced where they are, but as that table shows, they finally belong and stop stuttering when put together on their own - pulled out and re-assembled, they form a discontinuous but chronological chain of unique, non-repeating numbers, running from 352 to 1277, dated from May to August 2012. As the table shows, these numbers only repeat where they're inserted into the giant folders for 215 and 227 (other folders had more gaps between and don't have that problem.) What could this mean? So here it is: the real and carefully recorded prisoner numbers, as presented by the SAFMCD. If we accept their narrative and these numbers, in July or so branch 227 killed their detainee # 661, 664 and 669, but not those in between ... while 215 finished off its victims 662, 663, and 665-668, but no others in this range ... just after someone (maybe one or both of the same, or someone else yet?) killed their prisoners # 658, 659, and 660. Between them they filled all those slots and no others, with no located repeats between them. Then, 6 months later, branch 215 killed their six duplicate-numbered prisoners, and a bit later 227 finally killed its other 661, 664, and 669, at their designated time for killing all prisoners in that number range. Clearly, that's a bizarre scenario, and it has several implied instances. Sometimes a string of numbers bounces back and forth between 3 or 4 branches to the same perfectly collaborative effect. Consider this short stretch of 4 entries in the 800s eventually found in 4 different folders (215 and 227 duplicates layered beneath). Note - I've looked far and wide and I'm sure Ive found nearly all examples of this exact pattern. It's probably a bit above 133 all told. With virtually no other mid-2012 photos of any kind included, all the sizable gaps between these entries will matter, and suggest most of those just weren't included at all. The implied number of these is around 6-700 (full count forthcoming). With 133 identified in this study, and just a few dozen similar but non-pattern entries, over a range of perhaps no more than 925 (#352-1277) this extremely high missing rate is worth noting. Who didn't want us to see what? Because there was a lot of it. Q4: Why would several branches kill just these duplicate ID# victims, each offering a part of what becomes a single string of unique numbers like this, and do that over and over? The only answer the photo guardians could offer is this was a game of the security forces back in mid-2012 - the cruel genocidal regime was killing off prisoners arbitrarily by number, just to create these complete strings. Maybe it got too complex to keep up past August, when they shifted to just killing everyone in the same order they were assigned to the branch. (that's the "Caesar"/SAFMCD claim, once fitted to the photo record - see FC part 5, branch victim #). With only an answer that stupid waiting, we'll have to skip the asking and move on looking ourselves for something better. What else could it mean? The fact that this pattern appears in a string of hospital photos might be a clue, if indirect. I had a good guess what it meant at the start; I only began digging after noticing just one of these victims - identified as Majid Abu Draa (see profile) - has a card we can see. The same man is listed by SAFMCD as victim 215-1075, and also as 227-251. Any meaning to the latter is unclear, but the body photo included in the SNHR's report (search for "tubes" for the picture link) includes a non-blurred card that sort-of verifies the other given number. The card is washed-out but readable - in the usual system of Eastern Arabic numerals (see translation notes in part 5, here) we see 1075 written large across the card, rotated and darkened/enhanced at left. There is a clear line under it, and something unclear and minimal beneath it, maybe a letter that's hard to make out (their "n" perhaps - ن )- it must mean something, but it's not clear what. The earliest-seen cards otherwise, from the November, 2012 folder, have emphasized hospital numbers in the 2000-2100 range, and little to nothing else. This starved Palestinian branded 227-394 , has a card saying 2065, with two lines under it but nothing below those. Instead, across the top in small writing is (as a contact translated) "corpse number pertaining to" the final numbers, 4 and then a triple underlined 227 - or possibly one number 2274. The meaning of this is not clear. 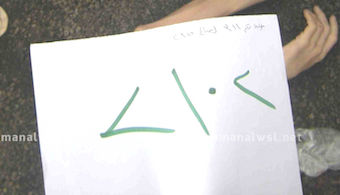 The forehead tape, as seen in this clearer photo says 393 above 227, along with more writing, all done upside-down. Another case just 37 bodies later is #2102 (215-311, 1-11-2012 - starved even worse). His card (cropped here) has no lines or writing beneath it - instead, along the top it has such tiny writing it can hardly have a purpose, and would easily be lost in most resolutions. His tape # is unclear, but likely says 215-311. I don't know what, if any, significance there is to the different colors of ink seen here: blue (usual), red (common) and green (rare). But in both cases, the big 4-digit number is not a detainee #, which is given and differs greatly. It's clearly what we call the hospital number. But on Majid's card, no such detailed writing can be seen, and the pattern in those two may not apply 1,000 bodies earlier. This could be nothing but hospital number and so I'd call Majid the same as the two above - except for the existing claim that this is his victim number in branch 215. Some might wonder if that is his victim number and they just didn't specify the branch at first. Whoever specified branches, that might be the case - in fact, it seems absent here, and you can see it creeping in small in the 2000-range cards above, and getting bolder over time (see example below). But the answer is no. As we'll see below, all the logic supports this being a hospital/body number, that points to the other 132 being the same, and they all make perfect sense in that context. First, the reader may need a moment to understand what "hospital number" means. It's disputed. In the example at right we see the common format used over the later span with the vast majority of bodies. The alleged detainee number and MI branch are indicated at top, and a bit larger across the bottom half is what I labeled Hospital 601 processing number, or just hospital number. Others use "examination number" or "death number." "Body number" is a fair way to think of it - It seems to be assigned on-site at hospital 601 based on the order bodies are received. 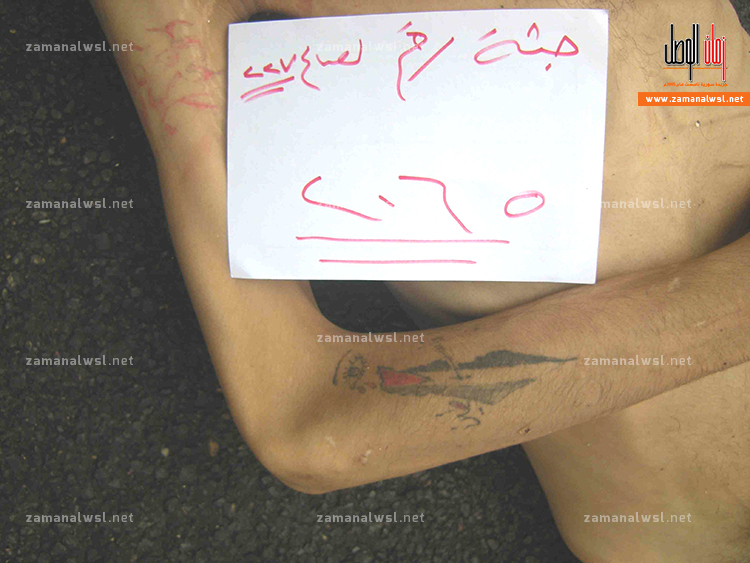 In Hamza's photo, no torture branch is listed on the card like with the "Caesar" photos. My suspicion for these is the blamed branches still have nothing to do with the bodies - terrorist captors made up the numbers themselves (but we'll come back to that) - and only the hospital number is more than likely genuine and official. I would guess that there is, or was, a detailed file associated at the hospital, attached to each number, for that unidentified corpse. The logged body was then stored in dirt at a government-run cemetery. If finally some family member came in and recognized a certain photo and backed up their claim, the Hospital number should then be correlated with a grave number for reclamation. This might be the real number recording the real sequence, and help us understand what the photos show. Over some 90 instances of seen body numbers matched to SAFMCD entries, the folder dates tick forward in time as the numbers tick up. This is mapped below (graphic to be improved - see also this ACLOS section). H# numbers I've seen are mapped along their sequence line, and correlated to victims with folder dates. I just drew the first and last correlation lines - in-between are usually 1-10 entries, all from that same folder. The first reliable start is (or seemed, might be, but... not reflected in the revised graphic) 2-2013 at around 3600 - so roughly 3,600 (coded? unidentified?) bodies had passed through by the span described (it's unclear if Feb. 1 is the beginning, middle, or end of collection, or even accurate). That many corpses in about 23 months would come out to about 150 per month on average, but rising rapidly; perhaps 900 or more are covered by end of that folder. Four months later, the June 4 folder ends at around 2800/b where /b means add 5,000 (see same ACLOS section) or 7,800 total by then. That's another 4,200 added in about 4 months. And in the last 2.5 months, combining images and reported analysis, at least 3,200 more came in - average rate there is about 1,280 per month, close to 10x the first year's average. What the hospital number does not say is who held the victim prisoner, or even that anyone did. It says only that this is another body in a tsunami of them, and the prisoner claims are just that - claims. Some were made verbally, some in writing, and all with no proof and limited logic. This sequential non-repeating number correlating to bodies over time is most likely nothing but an on-site catalog of just that. And if someone gives you a number just like it, claims it's a prisoner code, and it's got all this absurdity attached, they're probably lying to you. But that's what we have here in at least 133 cases as presented by the guardians of the "Caesar" photos. Another point supporting my reading of these alleged prisoner numbers is how, if taken as hospital/body numbers instead, they plot out quite logically over time and make perfect sense as body numbers at this time. By this, Damascus had remained surprisingly calm - perhaps only 350 unidentified bodies were processed in the first 12-15 months of the conflict (or maybe this numbering just started a bit later?) It was at perhaps 1,075 by July, by the August folder at least in the upper 1200s, an 2,065 was reached by or probably well before November. That would be at least 1,700 bodies in 6 months. This seems a likely rate considering the acceleration noted above. So this could actually be the record it would be - if these were hospital numbers. After the 1200s is an apparent gap more than 800 bodies wide, illustrated by the final two dots in the 2000s - these are the first of several other cases outside this hospital set - (explained below) photographed outside and later on - chosen for seeming out of sequence and/or having an unusual ID number, (usually very high), and finding that it's consistent with the running H# at the time - sporadic examples running almost to the end of the 10,000+ sequence. Examples: 227-2048, 227-2058, and j-2084 all share folder date 1-11-2012, and a strong visual similarity with asphalt-backed photos taken at that time - including those shown above (#2065 and 2102). These 3 victims have strange prisoner #s that would be less strange if they were actually hospital ones, issued right before and just into that folder's known range. Coincidence? Three more examples nearer the end (4308, 4315, 4643) could have been confusing - 4315 from unknown branch (1-2013) lines up with bodies of that date's H# range - but 4315 comes before unknown 4308 - way before. That one only makes sense - and it makes total sense - if we presume a /b suffix. And "b" means add 5000, so he'd be unknown body #9,308 - almost 5,000 after 4315. He's also dated later - 24-6-2013. 5,000 bodies in 5 months? As just covered - yes. 4311/b (this decaying guy seen with number in SAFMCD video) and other close hospital numbers are seen only in 24-6, with some overlap in the 7-7 folder. Ten more likely fits are all from the 2-2013 date folder. "Sporadic views" includes strange prisoner #s 3851, 3858, 3863, 3864, 3866, and surely more - numbers that would be less strange as H# alongside 2-2013 entries, which were in the range of at least 3634 to 4150. And finally, as unusual big set of ten or more victims were slimy with decay before photographed, but someone allegedly kept track of each one's high and consecutive "prisoner numbers" ranging from 3831-3840 (see here, "Decayed Victim"). Only 5 of those are shown on the SAFMCD site, with 2 others shown in other sources, and 3 just implied by numbers. They were killed (or found?) in the same time covered by 2-2013, ending just 11 bodies before the ones above - at least by what I take to be their hospital numbers. The cards for 3831-3840 also say "state security" above the number (they were blamed on internal security branch 251). So maybe these five seen entries are coincidental? No, more likely they're in the same pattern, but with the implied prisoner codes made up from H#s at the time of writing the card, instead of later. 17 examples so far confirm the pattern laid out by the 133 and bolsters my suspicion about where these weird prisoner ID are coming from. Note April 25: Further digging led to discovering 180 laundered numbers in the mid-2012 core (that's probably all of them), and 28 later examples (probably not all of them), for at last 208 total. Complete updated table will be in upcoming report. Q5: Why would so many branches coordinate the killing of their prisoners with sequential, non-repeating, numbers ... at the same time those are in the range of current hospital numbers? Was this the twist to their game that made it impossible to keep up? Maybe they didn't even have that many prisoners, and had to resort to killing them mainly all in transfer sequence for the next year. The odds of each of the questions Q1-Q5 above, multiplied one to the next, come out so amazingly slim that any reasonable observer must question that these numbers can really be as presented. At the very least, one must consider the simple answer as more likely than most would care to admit - these are invented prisoner numbers. We see what appears to be at least 133 bodies processed between May and August, 2012, with hospital numbers ranging from about 350 to 1300, but presented in little batches across the SAFMCD's blame frame. And so we see this only after identifying photos, digging them out, and re-assembling it. That's reverse engineering how they came to be as presented - someone split up this chain of photos and jammed them into the already large arrays of bodies blamed on branches of Military Intelligence. A majority of them were divided at the lines we see, shuffled directly to different folders to blame on a range of specific MI branches, seemingly with the H# simply swapped in as the prisoner number, logic be damned. But the biggest portion of them was found in the "unknown/anonymous branch" folder, where they sort-of belong - MI torture branch unknown, maybe none. But with so many of the same type clearly killed by other branches, viewers might conclude, these were too. They would presume those were their prisoner IDs, and somehow "Caesar" just lost track of who exactly issued the number. But as we've seen, this carries compound ridiculous implications when compared to the evidence itself. In January 2014 we first heard about 55,000 photos all showing a total of 11,000 prisoners. Then almost two years later we learned from Human Rights Watch about the two halves of the 54,000 (rounded up), where only one larger half showed supposed prisoners and the other showed - basically - effects of rebel-initiated violence (see FC part 4). The remaining photos of about 6,700 people called detainees do imply - by hospital numbers - about 11,000 bodies total passed through, but just bodies - not clearly prisoners of anyone in particular. Then between these numbers (11,000-6,700) is a clear implication of about 4,300 bodies passed through the same system and NOT included in the released photos. That's about 40%. (it seems perhaps 6-700 of these missing photos are in the sequence under study, as explained above ). So we were down to (the larger) half of (the larger) half of the photos - and now we can see even that large quadrant has issues like this running throughout it. The significance of this debacle is how it shows the photo curators taking liberties, faking some blame with a game that re-brands at least 133 as victims of this or that branch when apparently nothing else did in the first place. And it raises questions about the general honesty of the whole endeavor, the reality of the other thousands of alleged prisoner numbers, and the genocidal system they're said to represent. We have now virtually proven at least one significant manipulation of the evidence. Clearly, it was done. We can only speculate as to why. First, a basic point: whatever the reason behind it, why would the photo managers not invent more consistent numbers? One good guess is that by using a real and written-down number, like Majid's 1075 (and apparently they had nothing better), they could at least point to that if the issue arose and say it's no lie - that's a prisoner ID# and they just didn't specify the branch back in those days. But now we know that's probably the hospital number instead, so they actually can't do that. The following is my detailed guess as to why there was ever a need for fake numbers. It calls on precedents unknown to most people that need some brief explanation - so this conclusion is a bit long, besides speculative. But it is a fascinating story. Recently I started laying out the evidence that the "Caesar" photo victims were NOT government-held prisoners at all as alleged. It does seem at least 80-90% of these unidentified men and boys were held captive, but most likely by nasty terrorists of the greater Damascus area - Zahran Alloush and his Douma-based Liwa al-Islam are prime suspects, but other groups operating around Daraya, Deraa, Zabadani, etc. may play in (others would know more about this aspect). 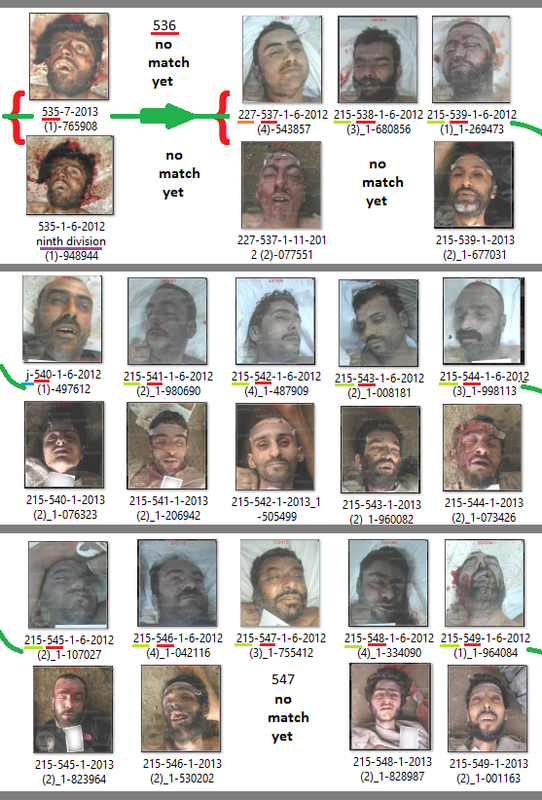 Evidence already suggests terrorists of the same class and area, if not the same exact groups, were behind the August 21, 2013 Ghouta chemical attack. Blamed on government-fired sarin rockets in the pre-dawn dark, the truth more likely is rebels gassed several hundred hostages that night in gas chambers they ran in the Ghouta area, seemingly with basic chemicals like carbon monoxide and chlorine (see here for captivity clues, report and summary article for the rest). They were caught finishing off a survivor in Kafr Batna by cutting his throat (see video). A little-noted feature of the Caesar photos running up to that event: a majority of the victims seemingly died from toxic gas inhalation, primarily something horrible and corrosive like chlorine, often while tied hanging upside-down (a proper explanation for that still in the works, sorry). It could be what we see is several thousand test cases for the Ghouta project. This chemical aspect will seem a dramatic stretch to many, but it isn't really essential to the following points. In the long run it must be addressed, and it comes up throughout the following. But for now the reader can freely scoff at these asides and still follow the rest of the argument. Chemical or not, such mass killings also could be a bold move in the Wahabbi-inspired genocide program against non-Sunnis, and general terrorism against the inclusive Syrian state and its supporters (perhaps this is why Damascus said nothing about it at the time?). That is, besides being a grand false-flag accusation against that same government. As covered in Fail Caesar part 5, and part 6, and again here... we would see Eastern Arabic numerals on forehead tape like that seen in the "Caesar" photos after the Ghouta massacre: it was the system used by opposition activists for the supposedly unidentified victims of that event - either to help keep track, or to conceal that they knew just who they were but didn't want to say. It seems the bodies were then buried unclaimed in mass graves, and probably remain there to this day (3 boy examples on the right side in the graphic below). We can see from the Hamza Khatib example the government also uses the same numerals in tracking the dead. But use of masking tape or writing on the body is not independently illustrated that I know of. Perhaps the government did this too for coded prisoners, but we know rebels in that area did it. Maybe it was the same people active in Ghouta who were scrawling numbers on their exterminated hostages earlier in the year and back into 2012. It would mean there were a lot of captives, and they were considered expendable. If that's the case, these victims were clearly handled differently than in the Ghouta incident; they would be killed and numbered, in whichever order, but then dumped quietly and left for the government to clean up. 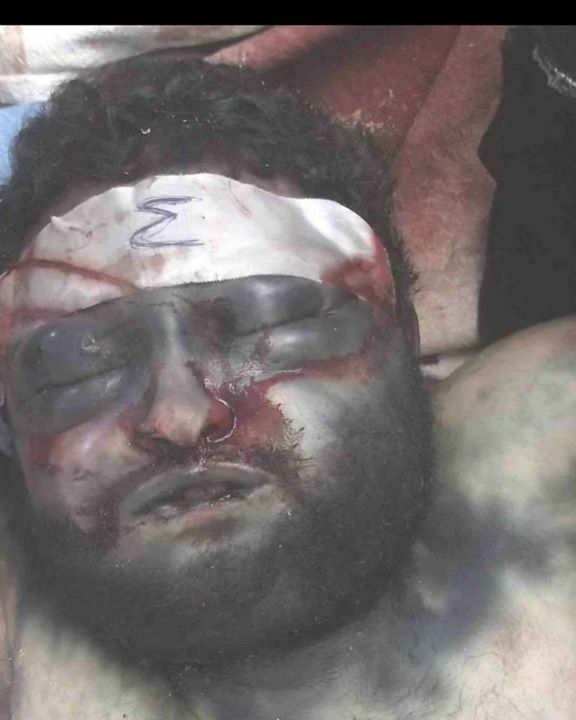 And so they would be passed through the official system as unidentified victims and buried by the "Assad regime" instead of by opposition activists. Along the way the bodies would pass under the lens of "Caesar," whoever exactly that was. The evidence would likely be left alone in most cases through the documentation process, making what we see a rebel-official hybrid system, managed by the opposition-sympathizing insider. "Caesar" and/or partners in crime may be doing nothing but "confirming" the numbers first put there by terrorists in order to blame "Assad." He's clear this was all the official procedure, but it's possible he's lying and the photos we see are from his own inventive system, maybe taken with his own duplicate camera right before or after the official shoot (for example). "Caesar" was careful to tell the SNHR how local rebels had no clue of his inside work - suggesting that they probably did know. If so, his presence would have been a magnet for horrifying bodies and the massive increase of them mapped above - if it's going to be an "Assad crime," why not make it huge? And maybe "Caesar" knew about the local terrorists and their plans ... According to the same SNHR report, he stopped documenting the possible experiments on August 20... one day or less before the false-flag gas chamber attack they might have helped shape. On 20 August 2013, Caesar decided to defect and leave Syria after he felt threatened if government forces discover that he had copies of the images he took. He also felt threatened by armed opposition groups who were not informed of his undercover work. Hospital Photo Insertions Don't Have Tape? 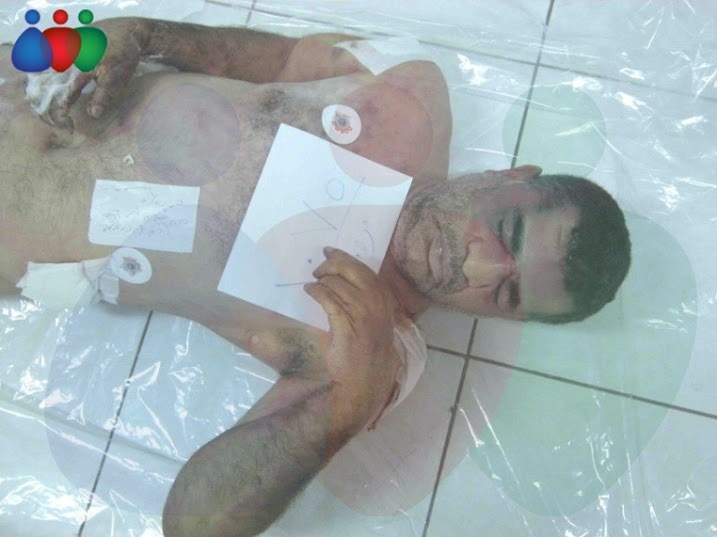 Scanning the inserted hospital photos, the majority of victims in the inserted chain - like Majid Abu Draa - don't seem to have this identifying tape, nor numbers written on them anywhere that's visible - at least when photographed. It could seem to be a later invention, but a few of them do have it: 600 bodies before Majid is H#443 (unknown, 5-2012). A bit later, emaciated elders 663 and 665 (blamed on 215, dated 1-7-2012). It could be that others had it earlier, but it was usually peeled off; it's hard to tell just by looking. Maybe those stuck with it are the exceptions where the photographer got to the body before the cleaners did. 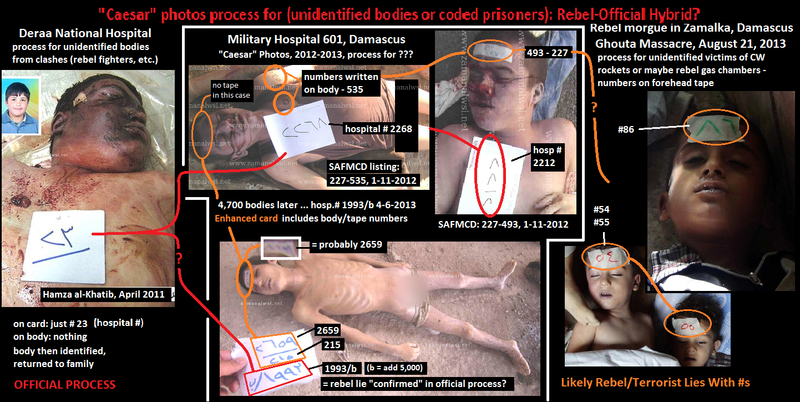 One case in between those - #645 from unknown branch (1-7-2012) - essentially proves tape removal was happening. 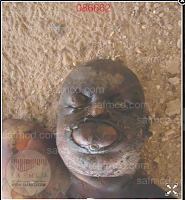 As shown here, this is a decayed body, about a week dead. 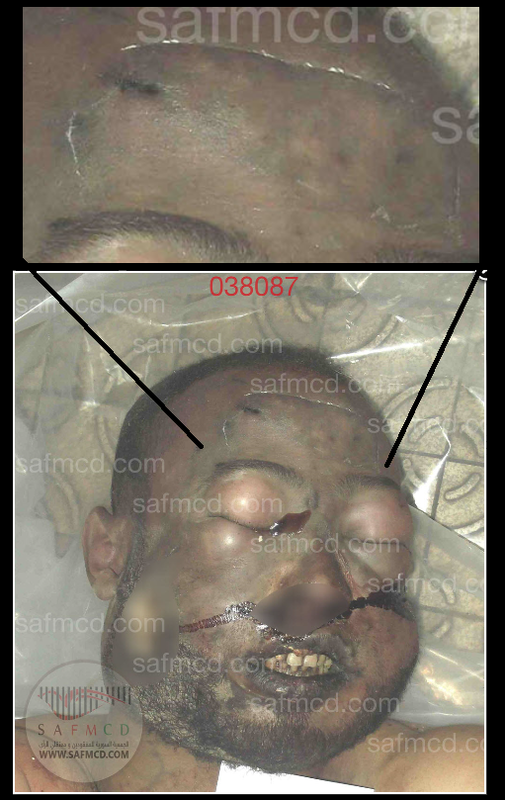 The seemingly damaged eyes and blood from mouth and nose (besides the swelling and darker color of his whole head) are consistent with the most common type of gassing we see - as noted with examples above, it was already operational in these mid-2012 photos. He was also once branded with some kind of tape across his whole forehead. Over the days between dumping and retrieval, the tape shrunk at the edges, the glue there fusing into the flesh. This left a sharp white ring when the rest of it was removed. They should have blurred that. By the narrative of team Caesar, this is his story: prisoner 645 of whoever was killed by unspecified torture, alongside similar-numbered prisoners, but unlike them (unknown 643, 644, 646, 647) his body was left somewhere to decay for a while before they were all documented in the same folder, perhaps even on the same day. Among these five, only 645 was given forehead tape by his regime captors, but then he had it removed for no clear reason so he was as clear-headed as the others in the end. Side-Note, April 25: There's another entry with a tape outline - unknown #635, ten entries lower but logged one year later, 1-7-2013. But that folder is just called 7-2013. 2012's July folder has a 1 ttached, has photos like this, and a photo of this exact guy. That's the same exact tape outline, same forehead scars, and same face with same hair and same blood trickles as #645, before most of the decay (extra decay in the eyes could suggest they were damaged). The outline is there all along, so it seems the rotting had nothing to do with what still seems a good clue for tape removal. What caused it, I don't have a guess. But we have a body counted twice, at the hospital on the same floor, with 4-7 days of decay in between. Curious and, as far as I can see, unusual. Why, I don't know. Which body number would be accurate? I suppose both. It would suggest both are accurate and make sense, unknown body #635 and then 645. It would mean nine other bodies were logged in the time it took him to get this icky, so 1-2 a day on average. In the chart above, both would be early in the 1-7 folder, so it's a slow start. After 645, at least 430 more bodies would be logged by the end of the month, about 3 weeks = 140/week or 20/day on average. To sum up: There was tape, sometimes if not always, when the bodies came in over mid-2012. It was sometimes removed later on, probably by someone at hospital 601 who didn't care what "prisoner number" the terrorists wanted that man to be. It seems likely this wasn't just occasional but rather the norm at this time. Q6: Why, if Hospital 601 was collaborating with Military Intelligence to conceal their systematic murder of detainees, would employees there regularly destroy the coded ID#s written there by their partners in crime? Or was this a rare good guy inside the system, done to defy the regime's MI torturers? At any rate it complicates the narrative of collusion spun by "Caesar" and his supporters. This tearing off of tape could be a disaster for the embryonic "Caesar" photos system, and indeed it seems like the numbers were probably lost in these cases. Maybe they were just scratched and the plotters started again at zero, complicating any reclamation of IDs that would then be repeated. These were likely left blank until someone decided on the fix described here - and they wound up repeating anyway. Any with the original numbers were just blurred and treated the same as the rest - use the hospital number instead. I'm sure the SAFMCD given # would not match what the tape says in these cases, but it would match the big 3-4-digit number written on the card. Later, the tape was mainly left alone. Why? Simple scale could explain this; they couldn't keep up, give full attention and care, or clean up the bodies. Just moving, checking, and documenting them all - and trying to save a few who were found alive - was hard enough (note: all those with medical intervention also tend to lack forehead tape). Generally the written numbers are kept documented from late 2012 forward as the tape stayed, "Caesar's" system improved and - perhaps for that reason - the death toll it was set to document and blame on "Assad" simply soared. That's why this debacle of the inserted hospital numbers might matter, as a glimpse of that system's humble and easily-disrupted beginnings. Fail "Caesar" part 6-D: Delay and Decay: Left to Rot, but Where? From a variety of sources and observations, the SNHR decided bodies were routinely left at the garage for days at a time. SNHR heard about 250-350 bodies total hauled every 3-4 days. (p15 ) This match suggests daily average between 62 and 116 bodies, while "Caesar" says it was up to 50 a day and usually less ... but numbers aside, the point is they were piled up for 3-4 days. Such a delay is entirely possible. But maybe that's just their false explanation for why some bodies seem to be left somewhere for days. As many have noted, most victims appear quite freshly killed, almost as if they were simply trucked from a prison nearby right after execution. But there is a minority of cases that show various levels of decay. 227 "zone" branch has more than most; 227-2478 (right) and 227-2485 are good examples of badly bloated and dead for probably over a week when photographed. 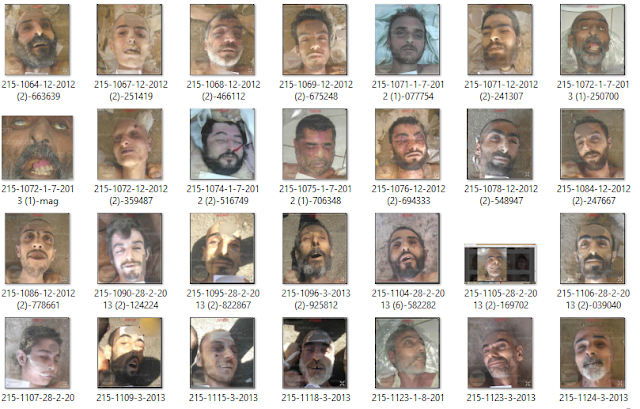 The upper 2600s and 2700s (from a 000 folder between 7-7 and 14-8 of 2013) shows a stretch of mostly one type of victim: starved, eyes seemingly gouged out, and older than usual - probably dead 3-5 days but left dry and dusty (ex: 2687). A few like 2690 and 2691 are turning black with microbes. Sometimes these are numbered consecutively with more recently killed people. 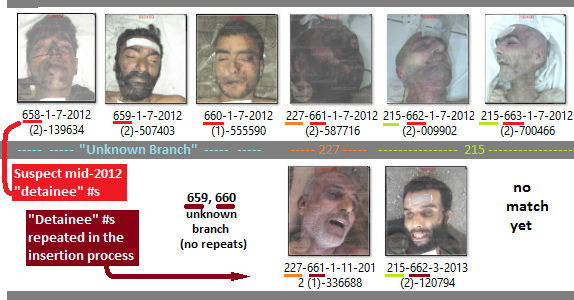 Branch 251 "internal security" branch - with by far the highest percentage of decayed bodies - has in its 3-2013 folder victims 63 (freshly killed), 64, (dead a week) 65, (dead a week and just partly shown (a bloated chin and mouth? )), and 67 (recent kill). I can't find 66 - it seems to be missing. Much higher in number (but in an earlier folder, 2-2013) are 251 victims 3835, 3837, 3838, and 3839, and 2340, with a wet and slimy decay otherwise not much seen. 3836 is missing as far as I can see, but is shown in the SAFMCD video in some detail at 6:54 (and also in an early photo - both compared at right). It's not a face anyone's likely to recognize, with a distorted head and layers of slime (also has a CV catheter inserted at the collarbone - see part 6-C). 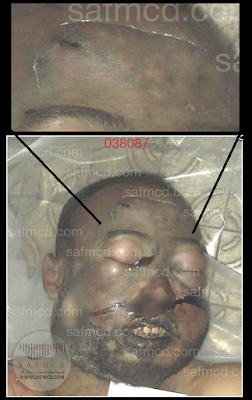 The slimy face photo mentioned above seems to belong to the same set, and the number - barely readable as 3831 - implies another 3 unseen anywhere (3832-3834), for at least 10 victims in this group, with only half shown on the SAFMCD site. Also consider this: If the hangup is mainly at the garage, then the decay has set in there - before the photo is taken - in these few cases anyway. Why take most pictures right away and wait 'til the end for a few others? So most likely the decay was before the morgue, and not at a security branch prison either. Most likely it reflects a haphazard collection process as with found bodies. In the broad collection most are found with unusual speed, and that's a point of interest. But in some cases it might take weeks for a corpse to be discovered. That would only be natural. Questions: At least 6 missing photos are in the spans described above. Most gaps aren't yet identified, and the one the was just in a set that didn't seem worth including in a database meant to identify victims by face.But other decayed bodies are likely among those "Caesar" didn't feel "safe" enough to save, or admit to. Was he trying to minimize the issue perhaps, by cutting out bodies dead for even longer? Was it perhaps a significant portion of the missing 40%? Was the swift processing trick not as uniformly achieved as it seems? 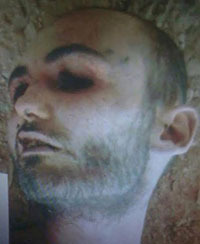 Note: the following was copied over from ACLOS: Torture Photos from "Caesar"/Photo Timeline page, which has been updated since. This post will (eventually, hopefully) be updated to a nice summary of that, and worked in better. I plotted out several dozen cases where I can match that victim to a SAFMCD entry, with original file name including folder date. The folder dates aren't gospel, and as we can see below they mainly aren't very specific - about one a month. At the moment, I'm taking the date as creation date, filled with new and maybe previous images, and also added to until the next one is started. Not clear. 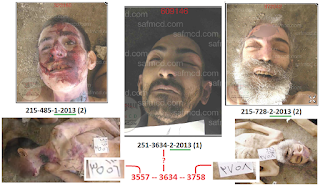 It's hyped how "Caesar's" photos show torture and repression for the whole conflict from March, 2011 to August, 2013. But the numbers suggest only about 1,000 unidentified bodies - less than 10% of the total implied - were logged between the start and July, 2012. 1,000 in 15 months is an average of less than 70 a month. Probably that many victims are listed, but no reliable #s yet. The earliest possible hospital #s are in the 500-1100 range – this is a thing that emerged analyzing Majed Abu Draa – it seems likely his hospital number 1075 was re-branded as branch 215 ID# way out of sequence - others in the span seem to fit the same pattern, often duplicating ID 3s in the process. … these seem to fit actually, correlating logically to June and July 2012 folders. But otherwise, there's a huge gap; the first clear H #s are in low 2000s, already in the 1-11-2012 folder. Here I've mapped the numbers from here forward, from 2,000 to 5,000, repeating 1,000-5,000 with a /b suffix, and the suggested 1,000+ past that, although no examples at all have been seen yet. It's not clear how far back the 1-11 folder covers, but likely some span - it's huge. And on the other end, #s reportedly go to over 11,000 and the last folder 14-8 is both huge and short on body shots with visible H#s - they probably do tick up that far unseen to us. So … this implies at least 8000 and perhaps over 10,000 unidentified or coded bodies passed through in 10 months, or the span covered by these folders. I suspect 1-11 covers the time frame of the Daraya in August and whatever else, from the size of it, so likely a span of one year. 8-10,000 over 10-12 month = Average rate: 700-1,000/month - at least ten times the rate over the first year. Final 5-6 months saw about 6,500 - at least 1,083/month. As mentioned above, case of Majid Abu Draa has an odd issue with his 215 ID# 1075 (he also has a branch 227 ID#) being seen in this fuller view on a card - no 215 is specified, and no other number. Usually when we see that, especially on early photos, it's the hospital or unidentified body number. As we'll see, that number makes sense in context of mid-2012. Supposed prisoner ID# is repeated three times here that I had found - 1071, 1072, 1123, each having on repeat an early, mid-2012 hospital photo like Majid's, the other like and dated like those around it. I've discovered more in the shown range since making this plate, further into the 110s and sporadically back into the 500s - maybe 70 entries or more, some with later duplicates found, some not yet. What are the odds they decided to kill several 500-1100 range prisoners in mid-2012 and the rest six months later (an unusual pattern), and happen to have several duplicate ID #s in this narrow range, and hardly anywhere else? Majid is the only case where we can see the number on a card, and it's shady - looks like "Caesar" decided to fill in some 215 victims that never existed, and re-branded the right hospital #s. It also helps prove his theory the branch victim 3 represents prisoner ID, not death or finding date - how can some of these people be found six months ahead of the rest? Right? Anyway ... he's the only direct glimpse but it leads into a pattern that keeps making sense. I noticed the same issue to a lesser degree in the 227 folder - which is less complete on my end so far. But I filled it in some more and then found enough instances to show the same pattern continuing. Some duplicates, usually with one a 1-6, 1-7 or 1-8 hospital photo. (there are some other kinds of duplication, but just one other set I've included below). As we can see, it's a and continuous string of entries with this kind of number jammed in even when it conflicts with later entries, split between two branches with no repeats noticed yet within the string, just within the branches it's jammed into ... noticeable switch-over points. Those with an identified later duplicate number they trip over indicated with a D.
Fail "Caesar" Part 6-A: Most Abductions Unreported? The SNHR's report explained "We were able to identify the identity of 772 victims including a woman; [of] which 123 victims were recorded in our database before Caesar’s photos were published." That was in October, 2015. 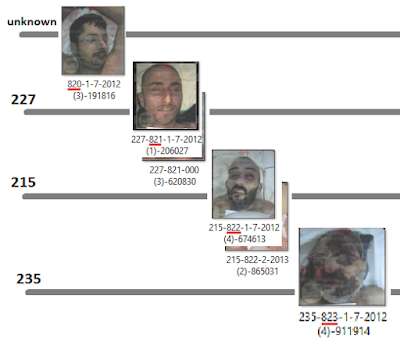 So the SNHR had 772 identities offered, 8 months after the photos were released and a mass of identifications came in. This is out of an estimated 6,700 or so total. It seems most of these came within the first couple of weeks, which would be strange given the huge volume of photos to search and unclear organization. As we'll see partly below, the purported identifications and back-stories are not very impressive as far as reliability and realism. And however good these nearly 800 claimed IDs are, there are still about 6,000 men and boys without even such a story offered. Before the, only 123 had been reported to the SNHR - and apparently they mean at all, as dead or arrested. 123 out of about 6,700 is a very poor record for a supposed human rights watchdog. It seems other groups were similarly quiet about the alleged mass abductions. 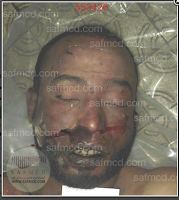 * Mohammed al-Tout (Douma) - arrested October 2012 while taking his daughter to the hospital, just driving on a street, not even being a rebel fighter - apparently not reported at the time by opposition sources, or for 2 years after, but recognized in the SAFMCD face shots by someone almost immediately in March, 2015 - from Douma, increasingly Islamist-dominated, where people of his rare family name have suffered continued bad luck with abductions and suspicious deaths. 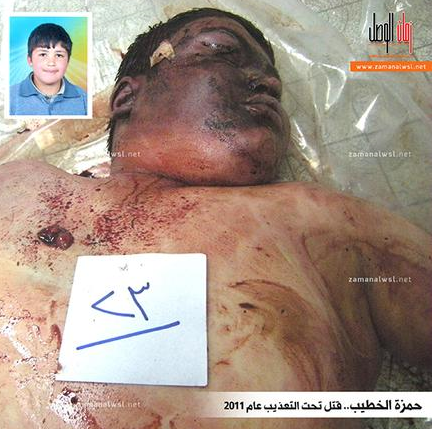 * Majid Abu Draa (Dummar) - listed as killed by two different MI branches, around June/July 2012 but apparently not quite - he was probably found still alive. He was never reported arrested; VDC lists a total of 4 Abu Draa men, all from Dummar, arrested: 2 are listed as detainees, blamed on the government, with no word about deaths. The other two just implicitly had to be locked-up - they aren't listed that way, but Majid and a likely relative, Alaa Abu Draa, were identified in the Caesar photos March 9 and 20. To be fair, there are no known claims on these openly-available photos coming from the other side. The Justice Ministry said the victims included soldiers and civilians killed by "terrorists," implicitly after detention by the foreign-supported fighters. But no one has backed this with a single public identification. Sad as it is, the opposition IDs are the best ones publicly offered - so far. But that's not very re-assuring, as the the above cases show. Secret deaths in an allegedly secret prison system only make sense, but what's troubling is how few of the initial arrests were noticed and publicized by the opposition, at the time it allegedly happened. Records of the opposition VDC paint a similar picture - dozens of victims identified from March, 2015 forward, with only a few now-identified victims (Rihab Allawi, Ayham Ghazoul, Hussam Sureym, Iyad Dabbas, etc.) tended to have some opposition credentials and/or have been reported arrested (not missing - it was always known who did it). However, just when even these detention reports were lodged is unclear. I checked a few cases for when it was actually entered in the VDC database. 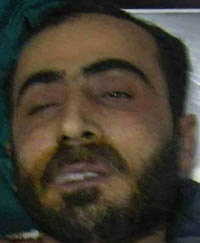 Martyr entry: Nader Khaled al-Eter. (includes photo, which also has a SAFMCD match: 215-3158 folder 7-6-2013). As usual, detention date isn't known (probably because it was never reported), but at least there is a VDC detainee entry for him: Detention Date: 2012-01-01 -- Release Date: 2015-04-18 -- Notes: "Detention date is inaccurate. The release date is the martyrdom date. 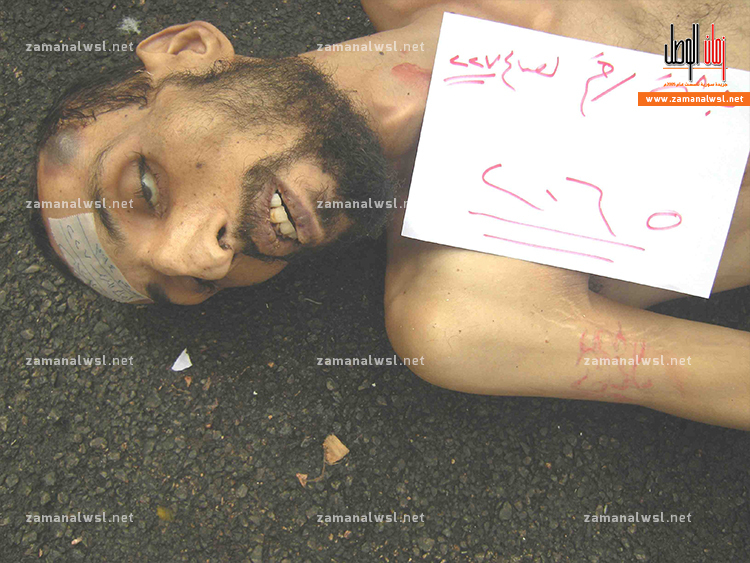 He was martyred under torture in regime prisons." Also, martyrdom date is inaccurate - as usual, it's the date in 2015 when the VDC heard about the ID. To be in the "Caesar" photos he must've been dead prior to August 2013. When did they add this to the entry? And when was the entry created? At the unknown detention time? Not likely ... Entry # can be a clue: Mr. Eter is detainees/67397. detainees/67398 says arrested 2014-1-1. 67396 and 67399 are the same. However 67394 says "The Deputy of Chairman of Kurdish National Council in Syria ENKS" was arrested by whoever on 2015-11-20, and released the same day. It was probably also the same day that Mr. Eter was finally noted by the VDC as a citizen in trouble. So, Eter must have been added about this time or later - November 20, 2015, noting an ID made in April. They apparently heard he was arrested back in 2012, date unspecified so left blank (Jan. 1). This was the first VDC heard about it, at least 3 years after the fact. Muhammad Jneed Al-Qiq - VDC martyr entry - from Daraa, Dam Road neighborhood. 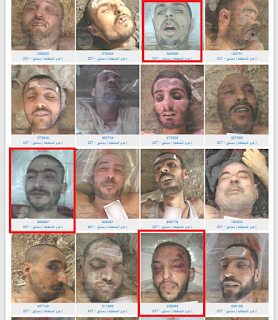 Date of death 2015-03-10, Notes: Martyred under torture in the regime`s prisons, Date of death unknown accurately." March 10 is, again, when they heard about yet another super-quick ID of a dead guy. He's an odd case, looking okay except for yellow fluid oozing out his nose. 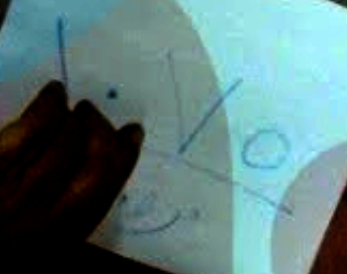 The fuller photo shows he's had a CV catheter installed , suggesting he was alive at the hospital (see 6-C). Notes Detention date is inaccurate. The martyr date is inaccurate. The release date is the martyrdom date. 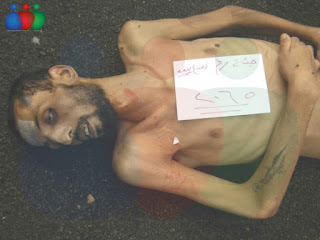 He was martyred under torture in regime prisons. Did not hand over his body to his family. 65036 - this will be about 240 entries earlier than the November 2015 one above. Before him appear several seeming "Caesar" photo victims they heard about at the same time (maybe in one bag batch, collected by some sub-contractor?) 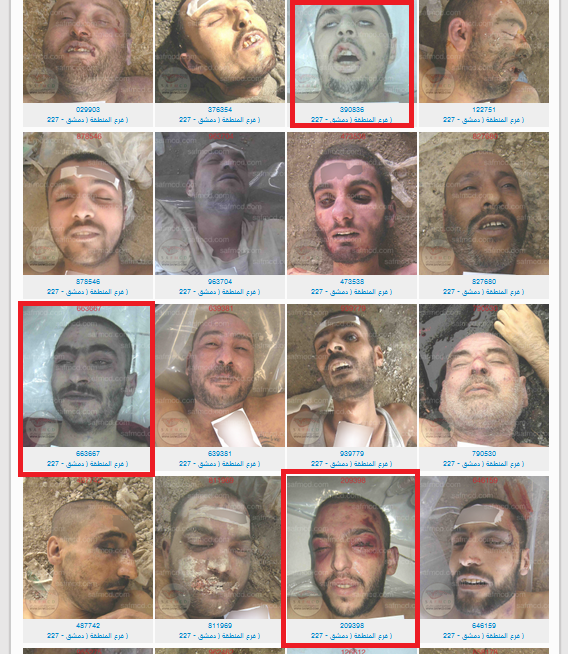 All are mainly from Deraa and Daraya, and say "was martyred under torture in regime prisons." The supposed family they heard from - very late in the game - say they never got the body back: "Did not hand over his body to his family." 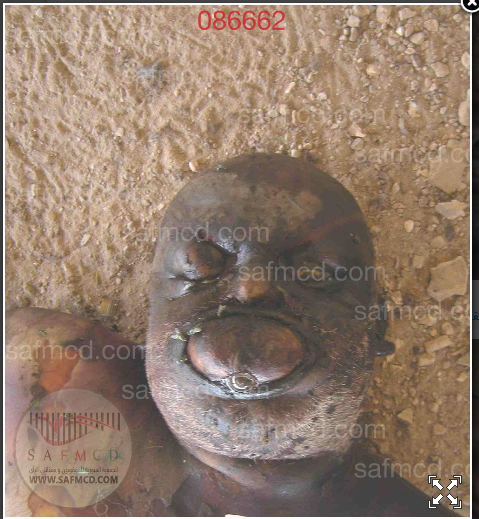 * 65020 Release Date 0000-00-00 He was seen in Rubaya in Homs in 2-2-2015. So ... arrested maybe in mid-March 2013 along with these others, and killed at an unclear time before August 20 ... However, his SAFMCD entry conflicts - victim 003 of who knows, folder 11-2011 - November 2011, one year, four months before that incorrect arrest date on March 14.Which was based on ... what? Perhaps a family member saying "He was arrested almost to years ago." But he was dead more than a year before that. And no one reported anything until he was identified in the photos, and/or by the time this was reported in November. Silence span: 3 years, 4 months up to four years. How many others like Hussam and even Rihab had their arrests noted so late? That would take some more digging to answer. But there are likely some -and probably close to the 123 initially recorded by the similar SNHR. In general, the remaining 6,500 or so victims could be anything, depending on what the better evidence indicates.